Even though he calls himself a registered Republican, former New York Times reporter David Cay Johnston sounds a lot like Bernie Sanders when he rails about economic inequities. And Johnston, 60, isn’t just bloviating. The Pulitzer Prize winner’s bestselling pair of books are steeped in statistics that reveal the IRS as a reverse Robin Hood: They Are Perfectly Legal: The Covert Campaign to Rig Our Tax System to Benefit the Super-Rich — and Cheat Everybody Else; and Free Lunch: How the Wealthiest Americans Enrich Themselves at Government Expense and Stick You with the Bill. Johnston will outline his analyses in a May 5 speech at the spring conference of Vermont Businesses for Social Responsibility in Burlington. He offered a preview of his comments — including a warning of a possible revolution in the United States — in a telephone interview from his home outside Rochester, N.Y. Seven Days: You’ve got a pretty interesting background — attending six colleges, for instance — so let’s start with that. 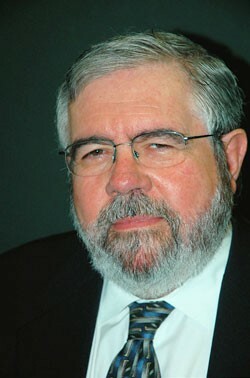 David Cay Johnston: I actually attended seven colleges. I was working at newspapers from the time I was 17 and moving from bureau to bureau, so school took a while. I started at the San Jose Mercury News and later went to the Detroit Free Press, the Los Angeles Times, the Philadelphia Inquirer and the New York Times. I still work as a journalist doing pieces for the Times occasionally, for a local alternative paper in Rochester and for The Nation and Mother Jones. I also write a column for a publication called Tax Notes. My first investigative piece ran in a local paper in California when I was 18. It was about a new type of concrete used in construction of a county building that was supposed to be inexpensive and make the exterior turn white as it hardened. But it was actually gray and had big cost overruns. SD: What got you interested in being a reporter? DCJ: I originally wanted to be a homicide detective for the LAPD. I had relatives who were cops, and it seemed like a cool thing to do. SD: And you became an investigative journalist instead. DCJ: The two aren’t so different. At the L.A. Times, I hunted down a murderer the police had failed to catch and helped win freedom for a young man who had been unjustly accused. SD: You worked at the New York Times for 13 years, until 2008. What was that like? DCJ: I never once saw the Times do anything but the right thing. The paper had a strong backbone. No matter how much heat they got for what I wrote, they never flinched. Incidentally, I was one of the very few reporters who got the Bush administration to go on the record. A couple of weeks into their time, I told the White House I wasn’t going to let them go on background. They said, “OK, fine, but then we’re not going to talk to you.” I told them I was going to write the story anyway and just say they refused to comment. They went ballistic but gave in. I only had to do it once. SD: How did you get so interested in the tax system specifically? DCJ: By 1980 or so I had come to see that political power was wrapped up in economic power, and I began to understand that the tax system was being manipulated by very wealthy people. Most tax coverage is limited to what politicians are saying. I’d learned to cover what the government actually does and not what politicians say. So I ignored the rhetoric and looked at how the system really operates. I discovered to my astonishment that the tax system in America is about taking from poor and working people and giving to the super-rich. I won the Pulitzer Prize in 2001 for stories on how Congress cut the auditing rates for the affluent and gave the IRS more money to audit the poor. By 1999, you were more likely to be audited if you were low income and had a job than if you were affluent and living on investments. SD: Given that you’ve been doing investigative work for newspapers for many years, what do you think will happen now that newspapers are in danger of going extinct? DCJ: Most serious journalism is still done by newspapers. What people see on TV at night typically begins with the work newspapers have done. The decline in print journalism is very bad in terms of protecting the public purse. Those who want to pick your pocket and enrich their friends are having a field day. But if newspapers do die, that won’t necessarily mean we won’t have good journalism. Ninety percent of blogs read like drunks talking in a bar, but a few of them are very, very good. I’ve long warned that the collapse of serious news could be a precursor to a revolution in this country. And in a country as complex and as contentious as ours, a revolution could make Pol Pot’s Cambodia look tame by comparison. SD: How could there possibly be a revolution in a country as apathetic as this one? There’s not much activism despite the economic crisis. DCJ: Revolutions do arise from economic collapse. We’ve had a decade of faux economics that has left large numbers of people with no jobs and no prospects. We’re destroying social stability, and we’ve lost sight of fundamental principles. DCJ: Where do you think democracy comes from? We got it from progressive taxation. It came about when Athens separated political power from economic power and gave ordinary people an equal voice. The only reason Athenians could get rich was because Athens made it possible for them to get rich. Civilization establishes necessary conditions, so the richer you are, the greater your burden to sustain civilization and democracy with your taxes. That’s not what’s happening now. Americans making $26,000 a year have a tax burden about one-quarter greater than a person making $260,000. If you make $50,000 to $75,000, you pay roughly the same rate as someone making $100 million. My books show how all these devices take from the many and give to the few. America did all right for many decades because we got the rules right — until the rise of Reaganism. We then abandoned conservative, time-tested ideas for radical ideas that were sold as conservative. All throughout the Bible, taking from the poor and giving to the rich is denounced as evil. Almost everybody who runs for Congress and certainly for the White House makes at least a show of going to church. So how can it be that people who profess to believe in the Bible have enacted hundreds of laws that prescribe what’s described in the Bible as one of the most fundamental evils? We’ve just been through an era when it was argued that the only duty of a corporate executive is to push up share prices. But you can manipulate numbers, and a corporation doesn’t exist in a vacuum. It has customers, vendors, employees — and all the infrastructure of a democracy. You can’t have a healthy company in a sick society. SD: Is that what you’ll be saying to Vermont Businesses for Social Responsibility? DCJ: The fundamental issue I’ll talk about is that, to make profits sustainably, you’ve got to help create a decent society. We need businesses that understand that employees who are properly paid don’t cost a business anything. Those who see things that way have for three decades been mocked and pushed aside by the Wall Street financier crowd, who have gotten us into this awful situation we don’t need to be in. Hopefully we’ll have a resurrection of ethical business. Let me also point out that we live in the only modern country where people go bankrupt because of medical bills. Employer-based health insurance is destroying businesses and sending many of our best companies overseas. The single biggest thing the government could do to improve the economy is to provide us with a national health system. Get the costs off the backs of employers and put them on society. SD: What do you think of Obama’s performance so far? DCJ: Barack Obama is a strongly decent man who’s trying to do what he thinks is best for the country, but he has no background in economics, and he has surrounded himself with people from Wall Street. Look at Larry Summers, his number-one economic advisor who got paid $5 million a year by a hedge fund for coming to work one day a week. Because of his very limited experience, Obama has been constantly outfoxed by experienced pols like [Senate Republican leader] Mitch McConnell. Obama has also been timid. His stimulus package is much too small. SD: How about Bernie Sanders? Your politics sound a lot like his. DCJ: I’ve talked with him a few times. Sanders certainly understands how to ask the right questions, but my politics are different from his. I’m a registered Republican. DCJ: No, I believe in the basic values that Reagan threw out. Just to give one example, going to college in this country didn’t used to be a loan business. Reagan helped turn it into a usurious business that’s out of control. Reaganism is over, but I don’t know what we’re going to do in the future. SD: There’s a debate now in Vermont about whether it makes sense to lay off state employees to balance the budget. Some say that would actually further harm the state’s economy. Some also say we should tax the rich more to help balance the budget. What do you say? DCJ: Without getting into the issue of what size government should be, I’ll say it’s penny-wise and pound-foolish to lay off nurses, police, librarians, the biologists who make sure our water is safe. It’s unwise to risk long-term damage to the society in order to meet short-term demands. On balancing the budget, I’ll say that state governments have devoted so many of their resources to helping the rich that they don’t have a lot of room to maneuver. SD: Do you believe the talk about “green shoots” and “glimmers of hope” — that we may have reached the bottom of this recession? DCJ: It’s like the guy who landed the plane in the Hudson. We’re on a glide path that nobody can stop. We’re going in. How bad it’s going to be is a function of how effective Obama and Congress are in responding. Unemployment is definitely going to continue getting worse. It’s possible we’ll go into a depression, but I think it’s unlikely because of pension plans, social protections, government’s spending abilities. But what we really need is demand-side economics, and that means jobs, jobs, jobs. Johnston will give the keynote address at the annual conference of Vermont Businesses for Social Responsibility on Tuesday, May 5, at the Hilton Hotel in Burlington. His talk starts at 8:45 a.m. Info, 862-8347.